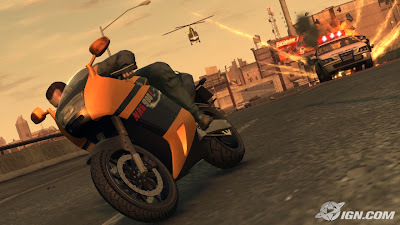 Ride the Machine: Game on-Grand Theft Auto IV. "Grand Theft Auto IV (abbreviated as GTA IV) is a sandbox-style action-adventure video game developed by Rockstar North. It is the ninth title in the Grand Theft Auto series and the first in its fourth generation. The game was preceded by Grand Theft Auto: San Andreas. Grand Theft Auto IV was released in Australia, Europe and North America on 29 April 2008 for both PlayStation 3 and Xbox 360. 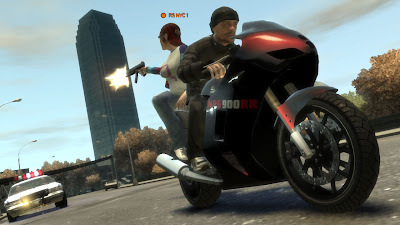 Two episodic packs are being developed exclusively for the Xbox 360, the first of which will be released in early 2009.The PlayStation 3 and Xbox 360 versions of the game will be released in Japan on 30 October 2008.Rockstar announced a Windows version of the game for release in North America on 18 November 2008 and in Europe three days later. The game is set in a redesigned rendition of Liberty City, a fictional city based heavily on modern day New York City. It follows Niko Bellic, a war veteran from Eastern Europe,who comes to the United States in search of the American Dream, but quickly becomes entangled in a seedy underworld of gangs, crime, and corruption. Like other games in the series, GTA IV is composed of elements from driving games and third-person shooters, and features "open-world" gameplay that gives players more control over their playing experience. GTA IV is the first console game in the series to feature an online multiplayer mode, which contains fifteen different game types. A major commercial and critical success, Grand Theft Auto IV broke sales records by selling about 3.6 million units on its first day of release and grossing more than $500 million in its first week. The game received overwhelmingly positive reviews, becoming the highest-rated video game of all-time on review aggregator sites Metacritic and Game Rankings for over a month after it was launched."